Merry Christmas, to all you Watery People. This is a strange photo. I took it through the garage screen door. 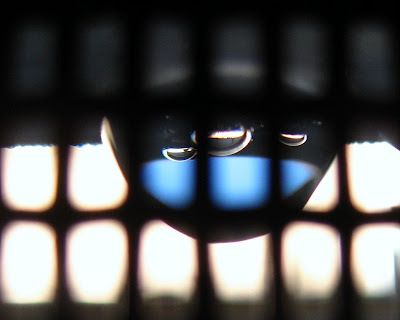 It's a single drop of watter, but it appears three other drops are reflected in it. Now this is strange. I first thought it was teeth. Cool shot just the same. Wonderful photo! You challenge me to see beyond the usual. That is a very unique watery picture. very nice. Ah, this is my kind of shot! Awesome! !